After success with two other world first underwater projects, Jacksons was approached to be a part of another Conrad Maldives Rangali Island world first! 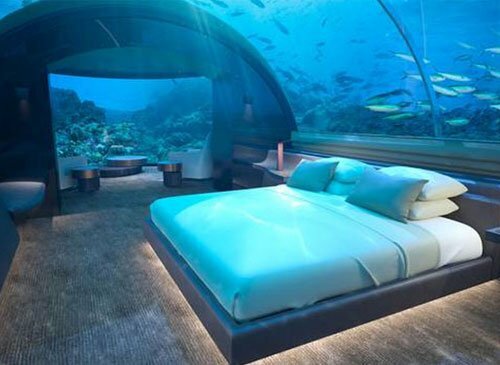 A US$15 million two-story hotel villa, the lower part of which will sit 16.4 feet below the surface of the Indian Ocean. There’s a gym, a bar, an infinity pool, butler’s and security quarters, an ocean-facing bathtub and most importantly an underwater bedroom floor with unparalleled views of the ocean. Connected to the upper level by a lift with surrounding spiral staircase, the undersea suite will be made up of a king-size bedroom with 180 degree views of the coral reef through to the deep ocean, a lounge also with a panoramic view of the surrounding coral reef and bathroom with fully glazed outlook onto the reef! Conrad wanted Jacksons’ expertise and prior experience in this area to make the experience comfortable and safe for the guests. Lance Jimmieson from Jacksons was charged with designing the project’s mechanical services, working on the air-con, ventilation, hydraulics, electrical and lighting works. For the past 18 months, Lance has been flying back and forth, creating designs that make sure the room has good ventilation, is safe to occupy and remains at an acceptable temperature – not easy when the room is underwater in 28-30 degree water! Lance isn’t the only Kiwi working on the underwater bedroom: the facility’s owner and project well-known Maldivian architect Ahmed Saleem trained in NZ and regularly uses a bunch of top Kiwi professionals, including overall designer Mike Murphy, Origin Fire for fire engineering, Aircool Refrigeration for mechanical installation, Plumbuilt for hydraulics and Direct Control for electrical and controls work. The chillers are also purpose built for the project by specialists CIR in Auckland.